What was a critical injury earlier today has now proven fatal for the woman struck by a D-8 Metrobus in Trinidad last night. She has been identified as Stephanie Richardson, 61, of Northeast DC. She was hit after leaving her bus and crossing in front of the waiting bus, when a second bus hit her in the street. This is Metro’s second major pedestrian collision in two months. 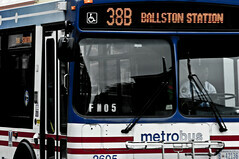 The driver, as of yet unidentified, has been in Metro’s employ for just over a year.